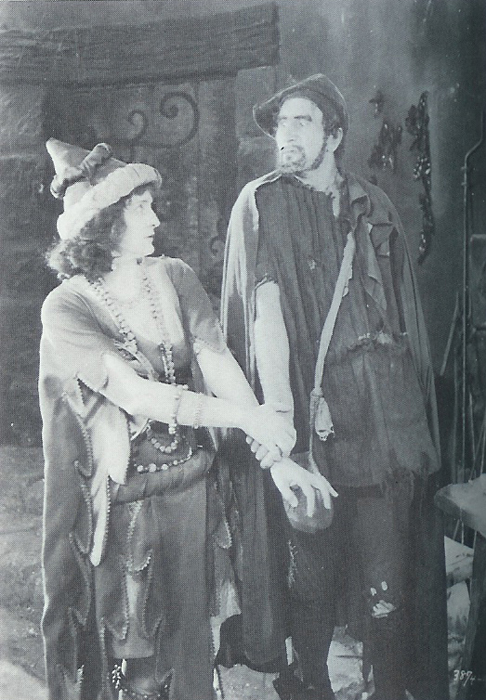 The Costumes in the 1923 version of Hunchback are for the most part good. They look appropriate to fashions of the late middle ages. 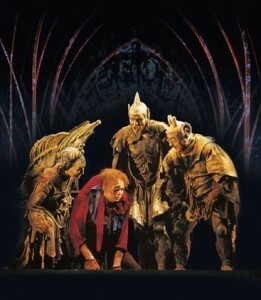 However with the exceptions of Chaney’s make-up for Quaimodo the costumes are not spectacular . There is no one costume that stands out and is memorable. They are just nice and appropriate to both the characters and the times. 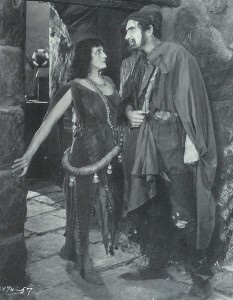 However there are two costumes I would like to discuss in addition to Chaney’s make-up since Chaney is the main selling point of the film. 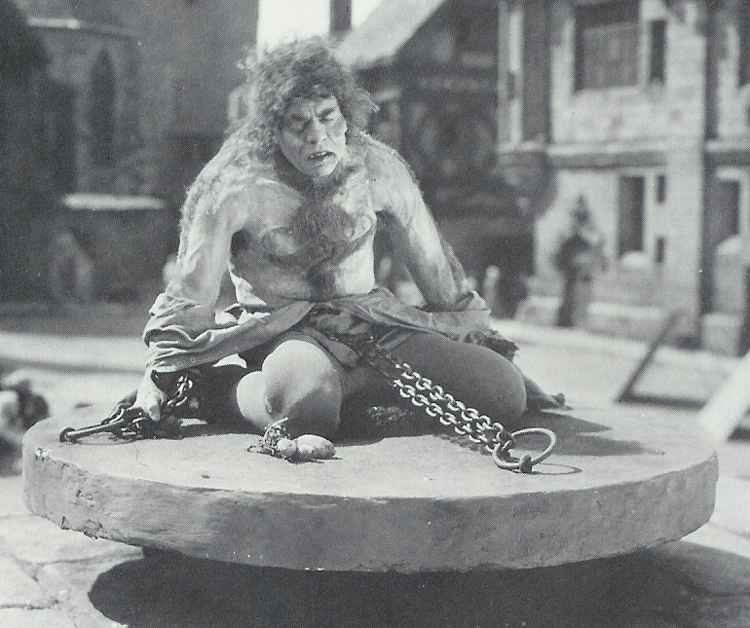 Lon Chaney was a genius with make-up. 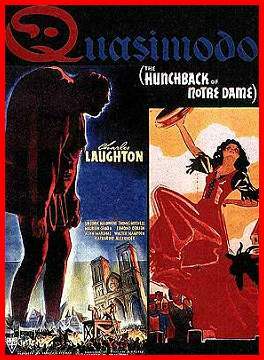 It’s not wonder that he has been dubbed the “Man of a Thousand Faces.” His most memorable transformations of his own face in his film career were the Phantom and Quasimodo. 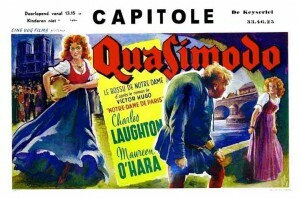 For Quasimodo, Chaney looked at illustrations of by Hugo to get an accurate look. 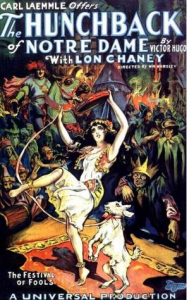 For his cheeks Chaney used cotton and colodium. Colodium is a skin sealer. What he would do it paint spirit gum, which is an adhesive, apply a wad of cotton to it and then cover it with colodium. The process was repeated to build up the cheeks to the desire look. This also allowed Chaney to reuse the cheeks for a few day with minimal effort. For the hunch he wore a 15-20 pound plaster hump. 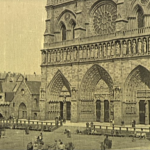 The hump was held in place by a leather harness that attract at the waist. It also had straps at the shoulders that attached to the belt to keep Chaney in a hunch position. He also wore a rubber suit over the harness in the pillory scene. 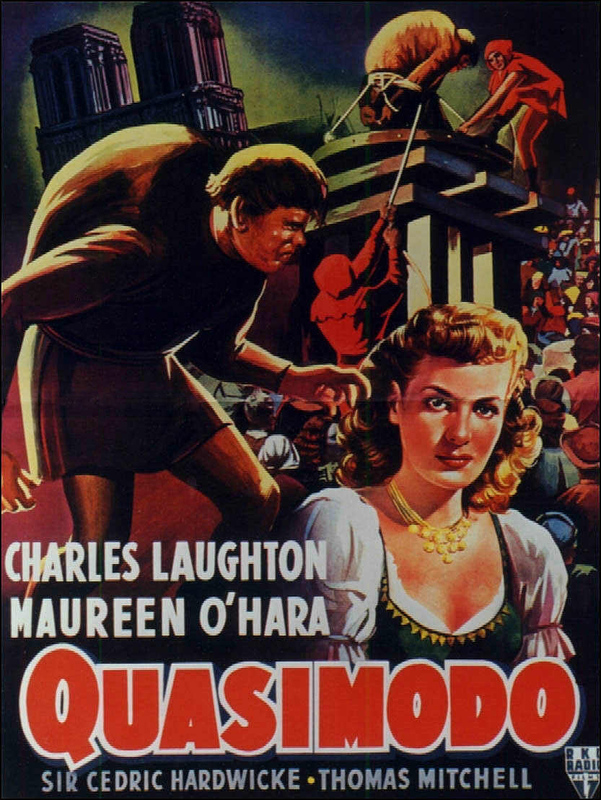 He covered it with hair to give Quasimodo an animal-like look. 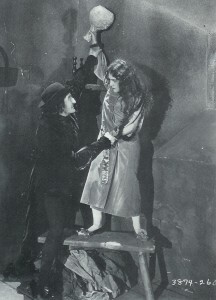 Early in the film he had hair on his knuckles but he did away with that as the filming went one. Chaney also employed false teeth and a wig. I don’t think the Quasimodo’s look has aged as well as the Phantom’s make-up but Chaney did help solidify movie make-up and set a precedent for the look of future Quasimodos so I do give kudos to the make-up in this version. 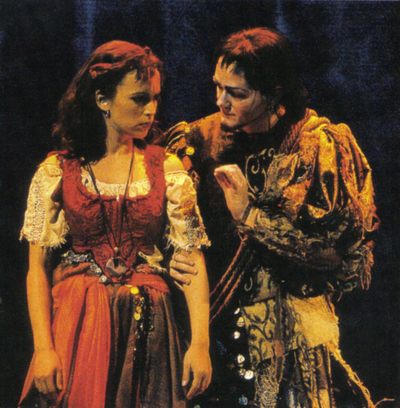 So there are a few costumes I want to discuss, three of Esmeralda’s and Marie’s costumes. 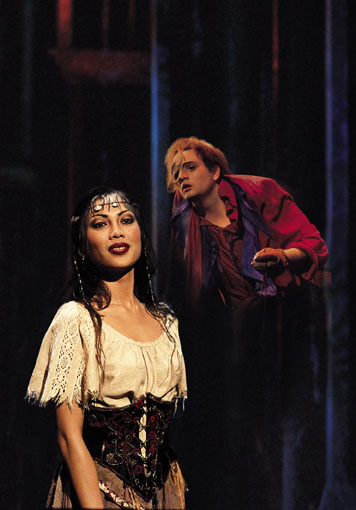 Esmeralda has four costume changes but I want to look at three, her normal outfit, prison dress and her robe. The Costumes were supervised by Gordon Magee, that they only costume credit I found. Esmeralda’s normal gypsy costume is based on a 1891 illustration. You can see it in the vest, short sleeves, the shoes and the mid calf hem line. 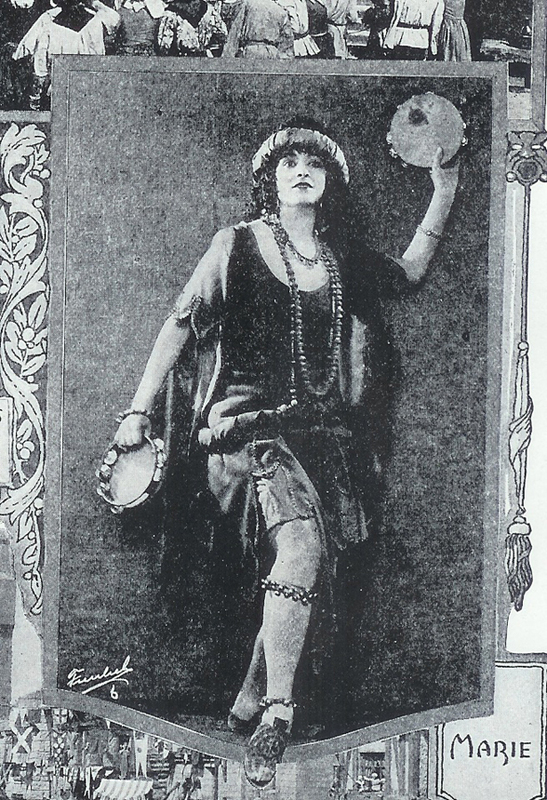 While I like this costume as a whole it is inaccurate to the Romani convention that ankles should not be expose but their is another force at work in Esmeralda’s costume; the 1920’s. 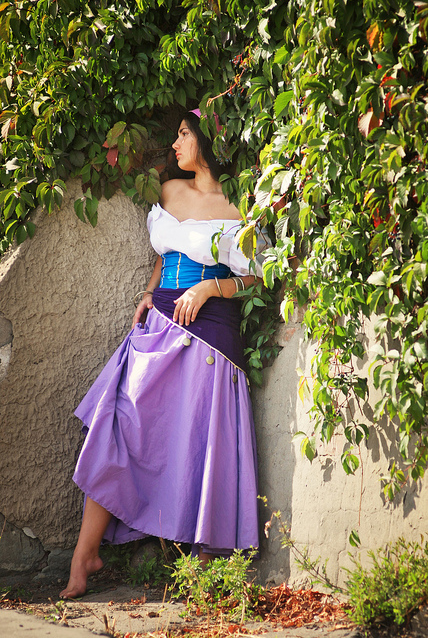 Esmeralda’s costume has a more shapeless silhouette, long beaded necklaces and the sleeves look straighter and look more like modern t-shirt. 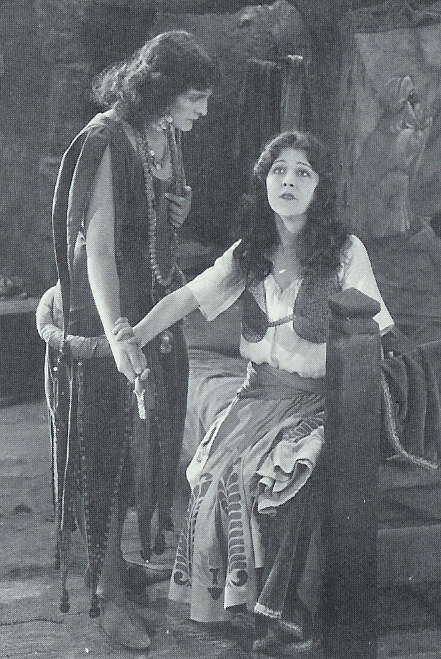 However Esmeralda’s prison dress and her robe look more like a product of the 20’s. Her prison dress has a shapeless silhouette and the way it cinches in at the waist and puffs over is very 20s. Plus the short hemline. 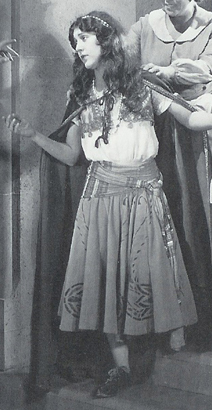 Hemlines that hit mid-calf was the style in 1923 for hem. However the robe is the worse offender of Esmeralda’s costumes. 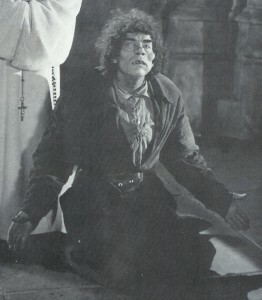 In a deleted scene from the movie, Quasimodo trades candles for clothing for Esmeralda to wear. 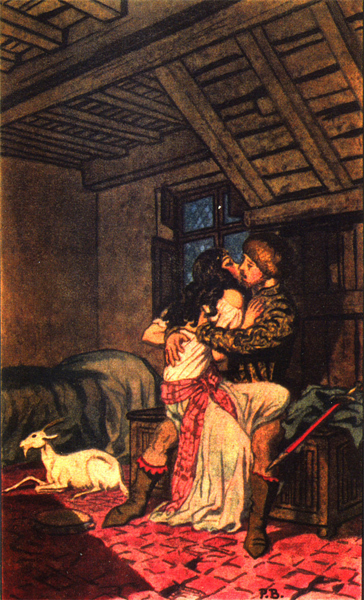 He gets a robe or a “dressing gown” that has a fur trim and looks to be made of velvet with a satin belt. Number 1; robes didn’t not exist at this time in Europe.. Robe/dressing gown came in to fashion in the 18th century because orientism was fashionable. 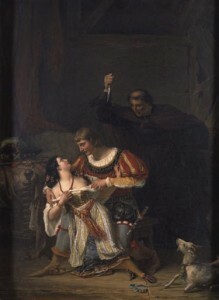 Number 2; given the materials, fur, satin and velvet, it’s doubtful that a mere chest of candles could be traded for a garment made from these materials. Beside those issues, the robe features the signature 1923 hemline and the shoes. The shoes that Esmeralda wears with the robe are flats with a flower detail. Clearly not shoes wore in the middle ages. 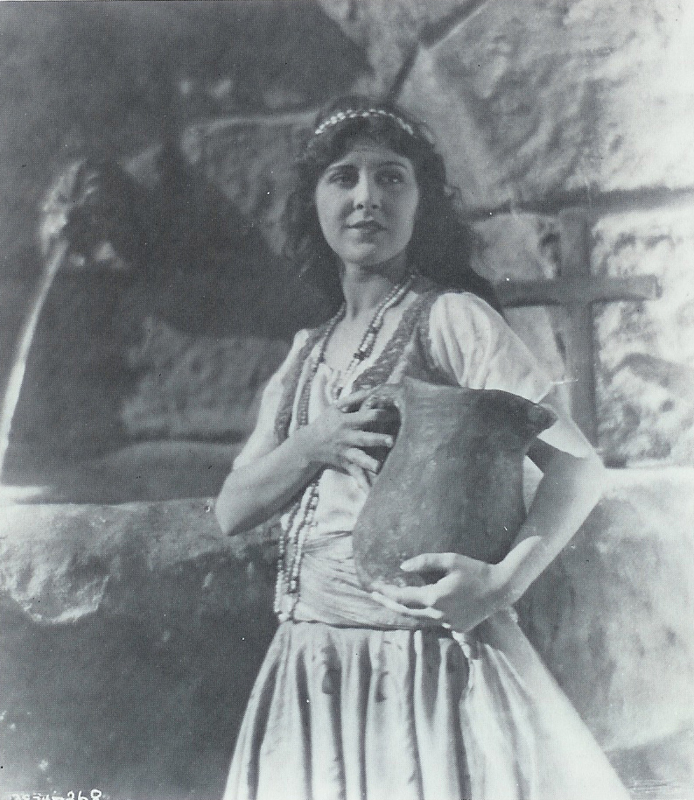 However the worse offender of the 1920 style in a costume is Marie’s. 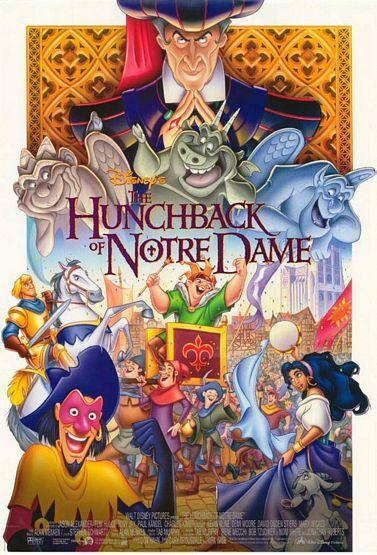 Marie is Clopin’s wife. Marie actually has two costumes but they’re very similar. Both are very shapeless dresses that flattened out her chest which is the classic 1920 silhouette. One has almost kimono-esque sleeves that have a scallops detail at the edge. Both hemlines hit at the ankles but one it’s a handkerchief hem, so the longest point hit the ankle. Handkerchief hems were popular in the 1910-1920’s and it was seen in Ancient Greece. 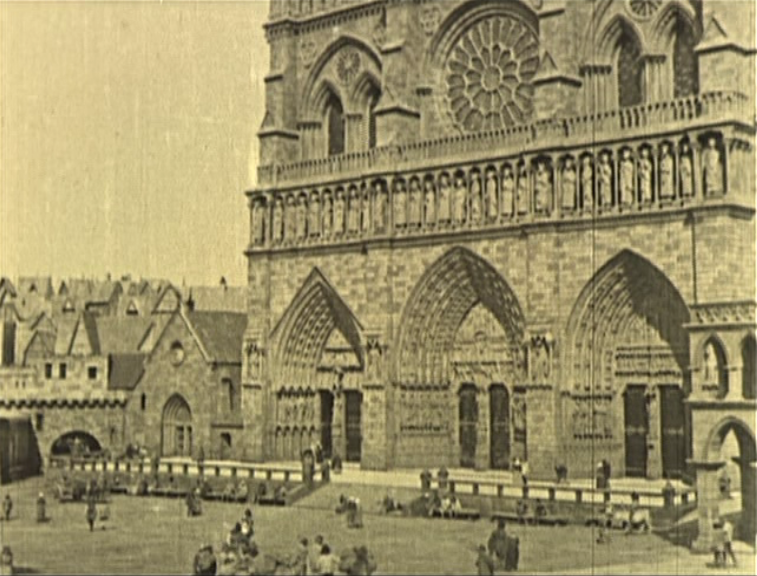 While it was used in Antiquity it was not at all popular in 1482. The other one is pointed with a scallop edge which makes it appear shorter. 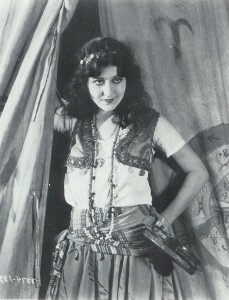 While Esmeralda’s costumes harken to the 20’s, Marie’s flaunts it to the point that it looks really out of place. The costumes are appropriately medieval for the men and the women’s costumes are mixed with the style of the 1920 to make they look more stylish regardless of period appropriateness. It’s still kind of a work in progress but it for the most part functionally done. the Lens is broken down for components instead of by casts. 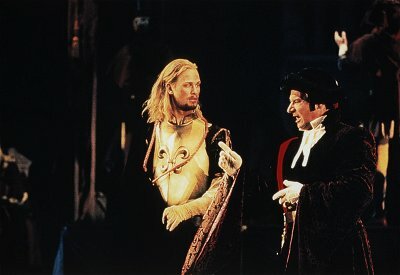 Tell me what you think What do you think of Fleur de Lys’s costume from Notre Dame de Paris or the Notre Dame de Paris Costumes in general? 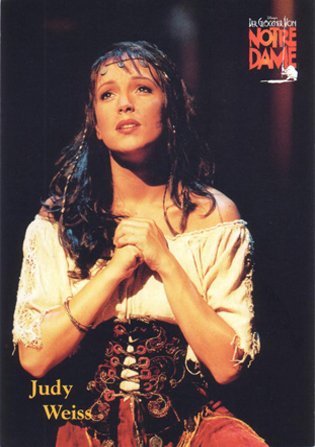 Hopefully I can do at least two more of these Notre Dame de Paris Costume lenses; one for the prison dress and one on Esmeralda’s bonus costumes. We’ll see about the male costumes. As Esmeralda been adapted for different versions of The Hunchback of Notre Dame, she has wore red a lot. The first couple adaptations La Esmeralda (the opera and the Ballet) her costumes has red details. In 1839, Belgium Painter, Antoine Wiertz depicted her in all red. 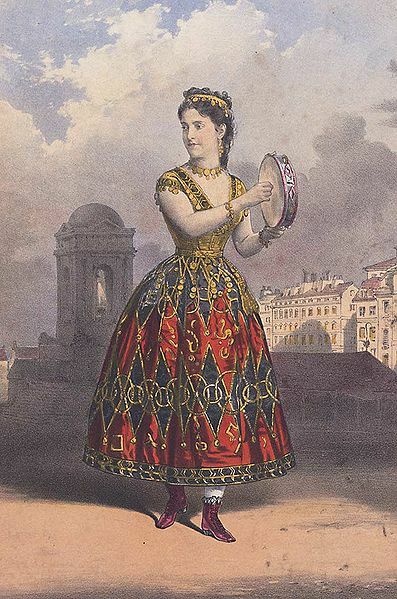 In 1870 ballerina, Adelina Patti, is depicted in a costume with a red skirt. The Ballets runs the gambit of colors from blue to green to pink though red seems to be the popular color choice. It’s not till we get to the movies that we see red surfacing as the dominate color for her. The 1923 movie has at least two instances of a colorized posters one is yellow and purple and the other has red details. 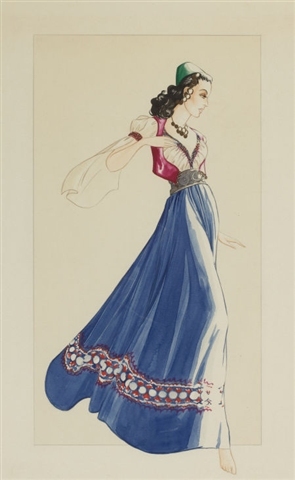 In 1939 despite Walter Plunkett’s design being mostly blue with red details and a red vest the coloration of her dress on a poster is all red. Though to be fair there are a few posters where she wears green and blue, but there is more red. 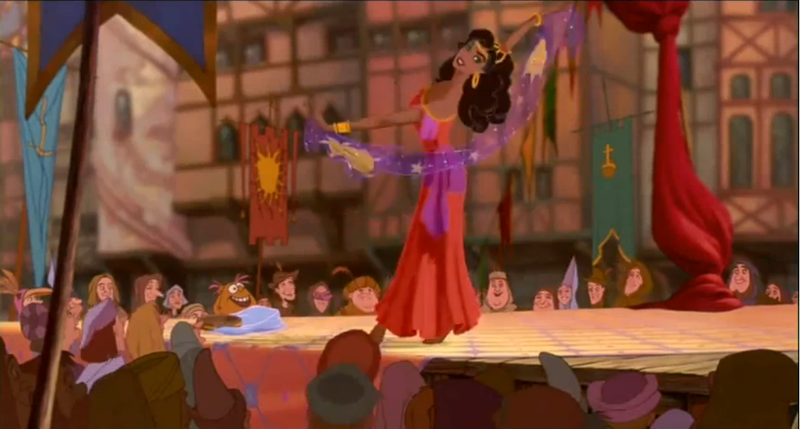 In the 1956 version Esmeralda wears all red for most of the movie. 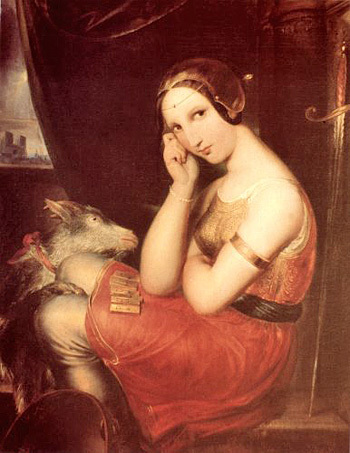 But I find it curious that she wears yellow at her ill-fated meeting with Phoebus over red. 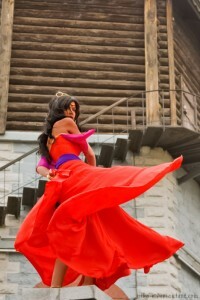 In 1996 Disney version Esmeralda wears red during her dance performance but for most part she wears purple. 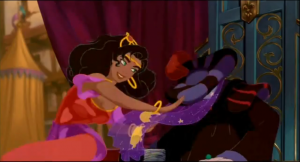 I do have to wonder if Anne-Marie Bardwell had something to do with Esmeralda wearing purple throughout the movie as she was credited in Character Design/ Visual Development and one of the animators on Esmeralda. 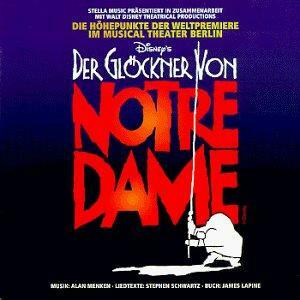 Though she wears red/dark pink in Der Glockner von Notre Dame the German musical. 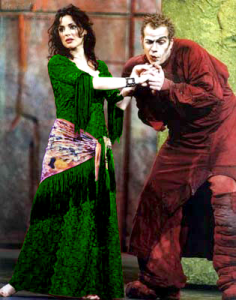 In Notre Dame de Paris Esmeralda wears green but there is one red dress that was wore for advertising for the London cast and the 2001 French cast. 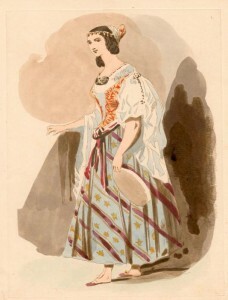 This dress is only wore once on stage in the Russian version during her meeting with Phoebus. And even in the 2010/2011 concerts Helene Segara wore red to sing the musical. Recently in the new illustration novel by Benjamin Lacombe and the Graphic Novel by Robin Recht and Jean Bastide, Esmeralda wears red. When you look at all these instances, why is red her default color? Is it because green is too obvious for her given that her name means Emerald and red is opposite color to green making it the non-obvious choice? Seems a rather simplistic design notion for a costume, especially when one thinks that the color red is in total opposition to her as character. The color red typically is associated in Western cultural with passion, desire, love and sexuality. 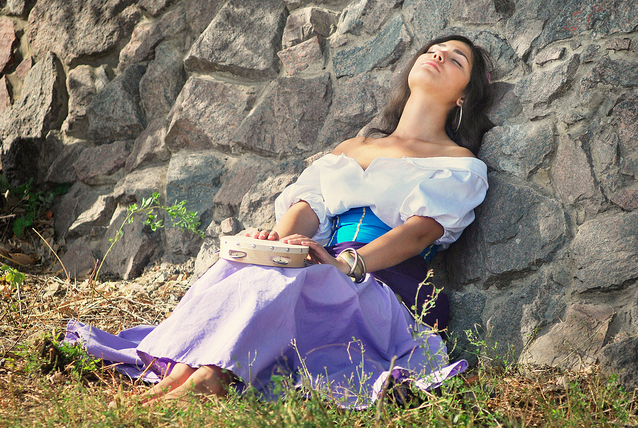 Esmeralda’s personality is lighthearted, innocent, naive and modest. She doesn’t seem the type character to outwardly express her sexuality because even though she inspires desire in others, she herself is unaware of it. Red is also in opposition of Esmeralda’s allegorical role as the Virgin Mary who traditionally wears either wears blue or turquoise. 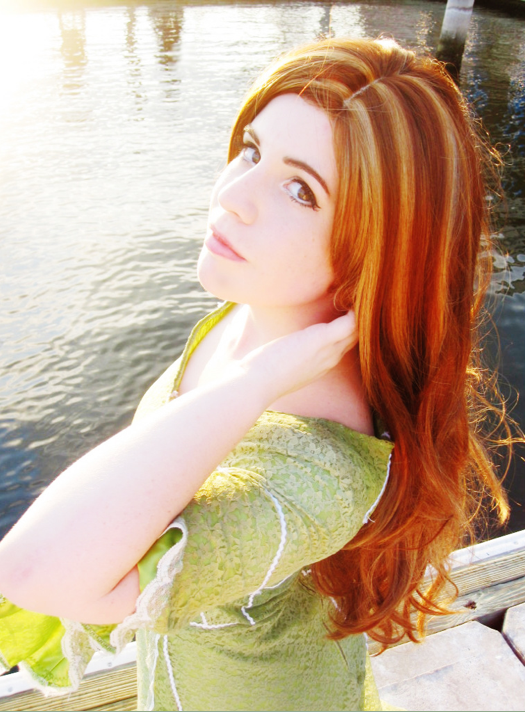 Red also seems to age Esmeralda, her main point of interest in the novel is her youth, blue and green are more youthful colors but red comes off as mature. 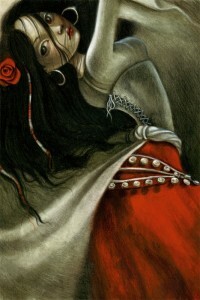 Finally in the Romani culture, red is a color of ill omen as it’s associated with Blood (The Lure of the Gypsy Culture ) Though maybe the costume is meant her to be ironic like she is subconsciously giving her in to tragic fate, though she lives more often than she dies and I don’t think the costume designers are that clever or that cerebral. 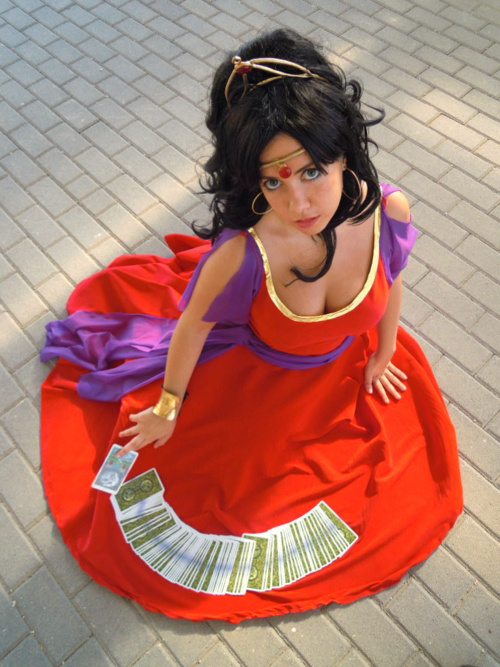 However, maybe this whole matter is quite simple, does Esmeralda wear red in the book? In the book there are only a few instances where her clothing is described. 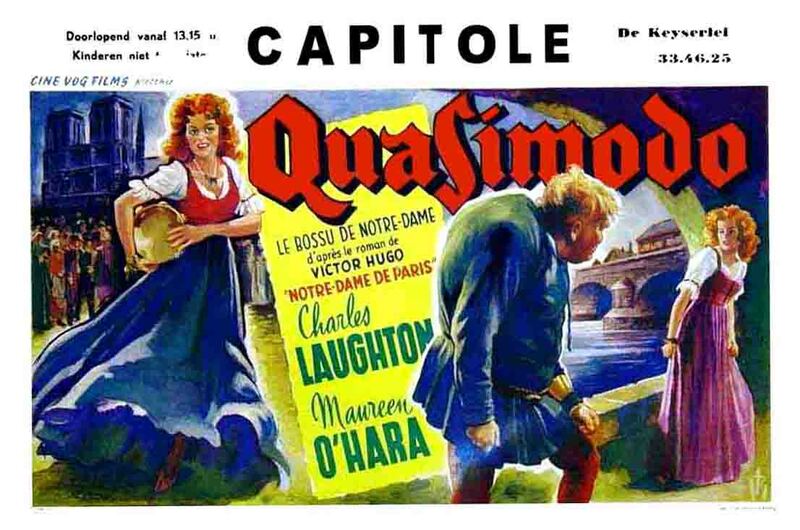 When Gringoire first sees her, she is wearing a golden bodice (Book 2 chapter 3 Kisses for Blows) Frollo mentions that she wears blue when he first saw her dance (Book 8 chapter 4 Lasciate Ogni Speranza) and of course she wears white in the later part of the story when she condemn to die and brought into Notre Dame. I think there maybe an instance of her wearing a multicolored skirt but I can’t find the instance in the book and her necklace that contains her baby shoe is stung with red seed beads, other that she does not wear red. So why is she in red since red is in total opposition to her as character and there is no precedence for it in the novel. 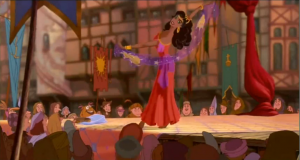 If Esmeralda doesn’t wear in the book and it’s a color that is against every aspect of her character why does red seem to be the color of choice for her. One reason I think is red is an easy color choice to make for when a character is suppose to stand out and be thought as desirable. There might be another level, Esmeralda is a Gypsy, this gives her an sense of exoticism and one popular style of art in the 19th century was Orientalism. 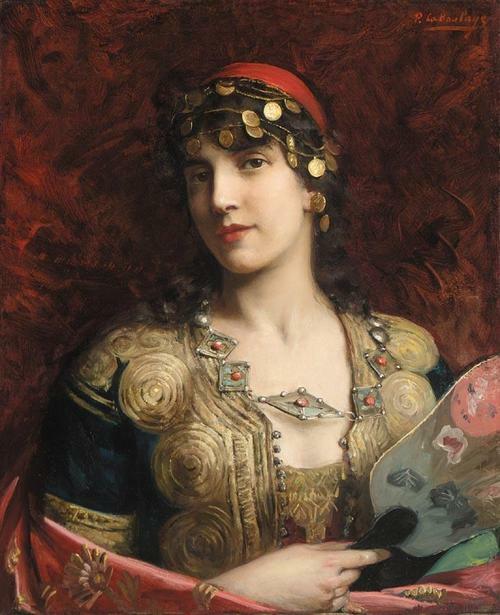 Orientalism in art meant depicted exotic sense from place that were exotic to Europeans. The paintings use a lot of rich colors and a lot of red especially for women. 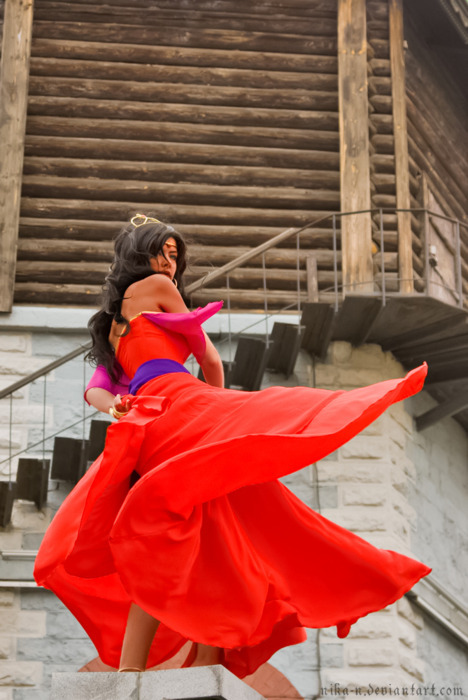 Red is just the wrong color for Esmeralda as a character and is it far too over done to be her dominant color anymore, details are fine but it’s too much red but in over 170 years worth of adaptations it has become a boring cliche. I think this is a cliche that need to at very least ebb. Costume designers of newer Hunchback adaptions if you read this please consider using different colors and if you must use red make it details or at the very least try a different tone it doesn’t always have to fire engine red. 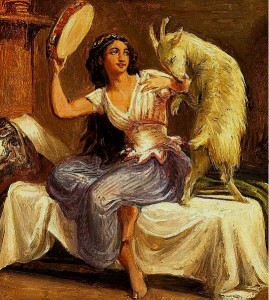 I was reading on http://notredamedeparisfans.tumblr.com/ that tumbler user express a dislike for Esmeralda’s green dress from Notre Dame de Paris. You can read the post here (post doesn’t seem to be of NDdp Fan anymore). She finds the dress to be like a sack with no movement and thinks the show should have opted for more traditional gypsy costume designs. Overall she doesn’t care for the design. Now since I don’t have a tumblr account and I made a squidoo lens on this topic, I’m going to offer up a defense with a blog post. However this is not the first person to express a dislike for the costume. So it’s nothing new. I really do like the design I think it’s pretty and has a fashion edge to it. Of course I do not like all the versions of the dress. 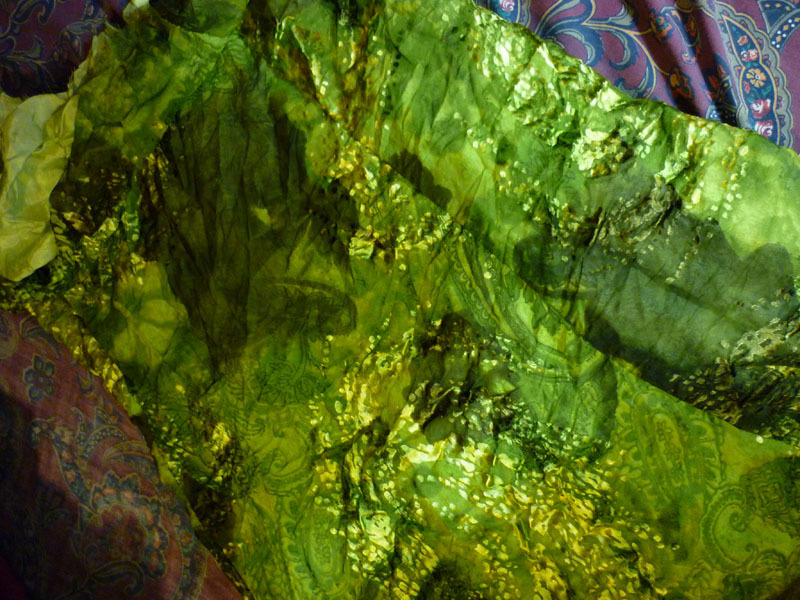 I tend toward the ones where you can see the texture more and I prefer one that are not floral patterns. 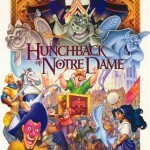 I think the reason why the show didn’t opt for the cliche “gypsy” look was the show was trying to go for a “modern” and less of the musical vibe: more like music video as musical in France were not popular in 1998 (they mentioned this in either the featurette or on the frequent star special). 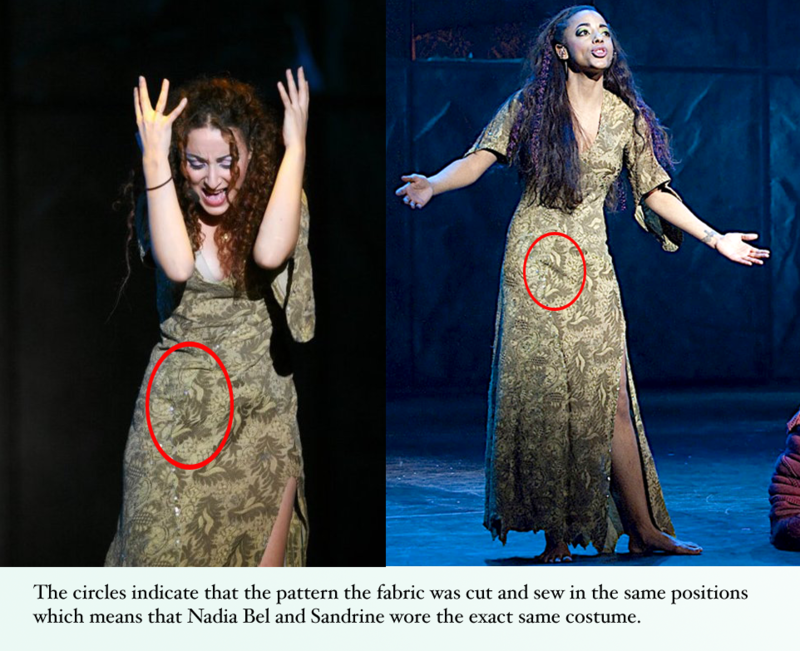 This is probably why they got Fred Sathal do the designs. Sathal is a fashion design with costume-like POV but not a costume designer, so all the costumes are not typical musical costumes. 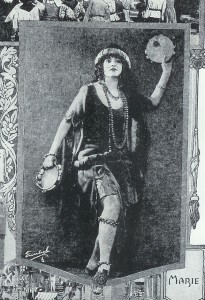 As for the movement, the dress does have some movement (watch Bohemienne) and while Esmeralda is dancer as part of her character, the actresses are not cast for their dancing, so the movement of the dance factor is mute point. 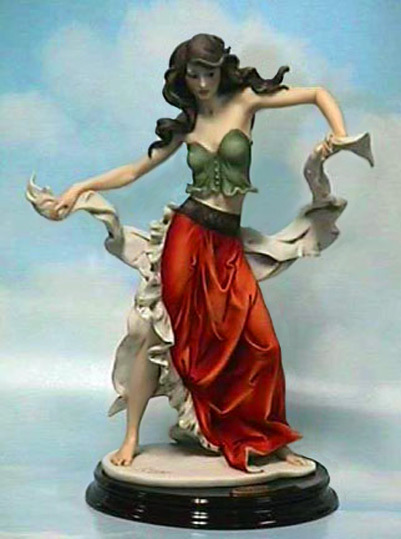 I mean when an Esmeralda does dance she moves her hips, spins, runs around and/or does hand movements, not exactly movements that need a flowy skirt to showoff the quality of movement and lines (well maybe the spin do). 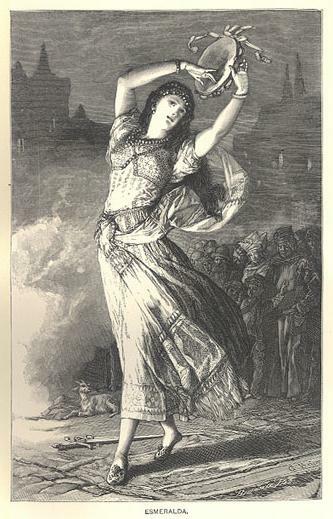 Plus she only dances once in two hours, so the play isn’t that interested her dancing. Later in the tumble post it’s mentions that red promotional dress that was used for London cast, French cast and was used in Russian version is prettier. 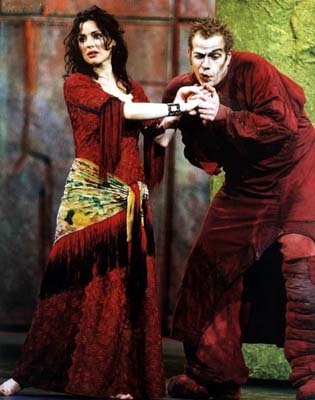 Problem with that dress is the color is red which is Quasimodo’s color so it does really work for the show. 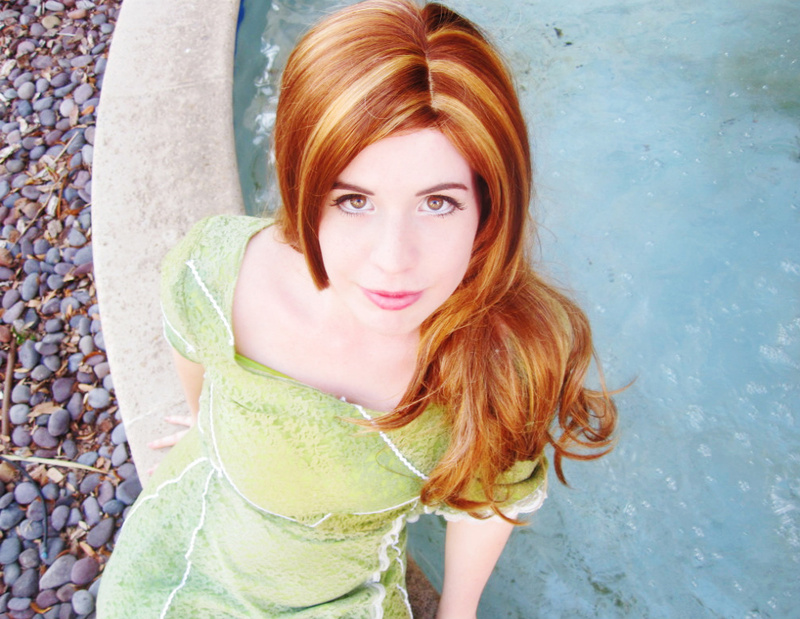 Unless the colors are switch ( but I prefer Esmeralda in green, red is too cliche) or the dress was made green the dress. I wonder what that would be like….. I like the red promotional dress, I just don’t care for the fringe, especially on the sleeves. I kind of like it in green though it’s pretty in red. Also for the record I like the second act dress too (I’m planning a lens on that too ^_~). I like flutter sleeves, cowl necklines and ruffles. Consider that the dress is a prison doesn’t make a ton of sense but when did musical have to be logical. Maybe another cast versions should change up the costumes a bit variety being the spice of life. But let’s hear from you what are your thoughts, people? 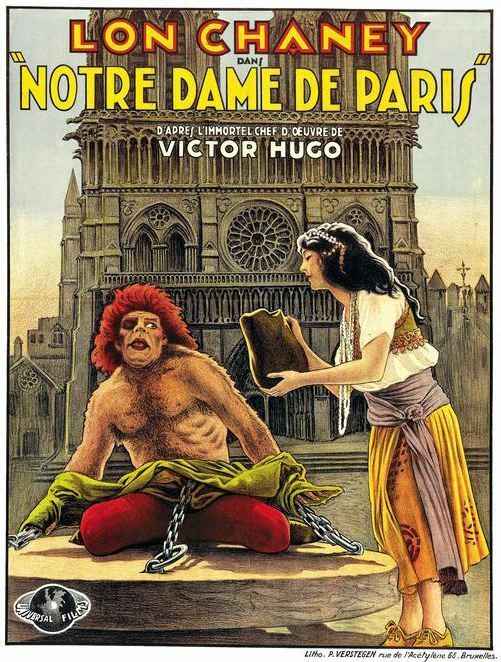 Do like the Notre Dame de Paris Costume Style or should it opt for a more traditional musical style (whatever that means)? I just finished a new Squidoo Lens. 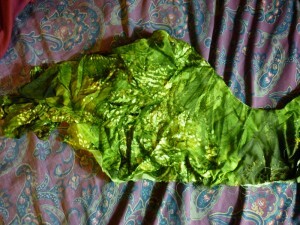 It’s on Esmeralda’s Green Costume. I want to make a few lenses on the Costumes from Notre Dame de Paris. 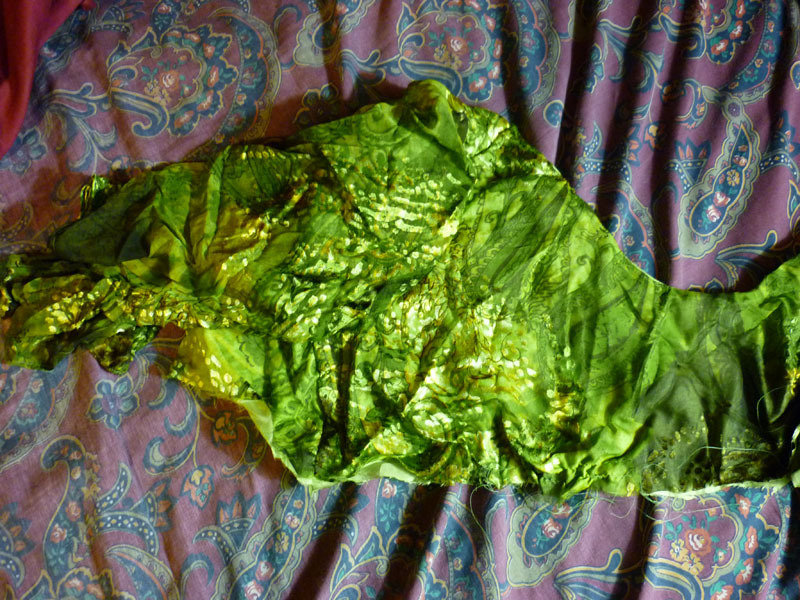 I picked the Green Costume first because it’s iconic, it’s my favorite ^_~ and it differs so much from cast to cast. This lens is the reason I’m late with my article this week. This lens was labor of love for me ^^. 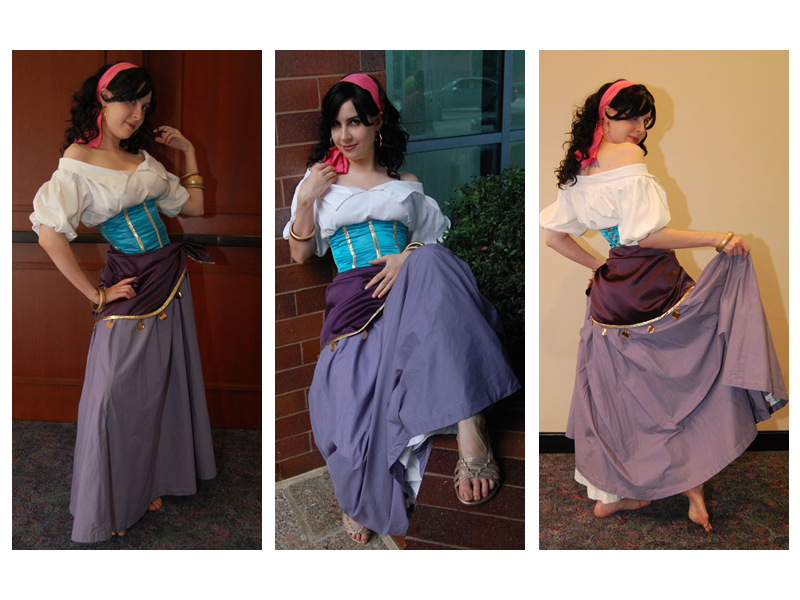 Please Enjoy though I may add more (sewing patterns that work for this costume are hard to find). So it’s Friday and it’s right before Halloween and what’s more Halloween than Costumes? Candy but Costumes are more fun. 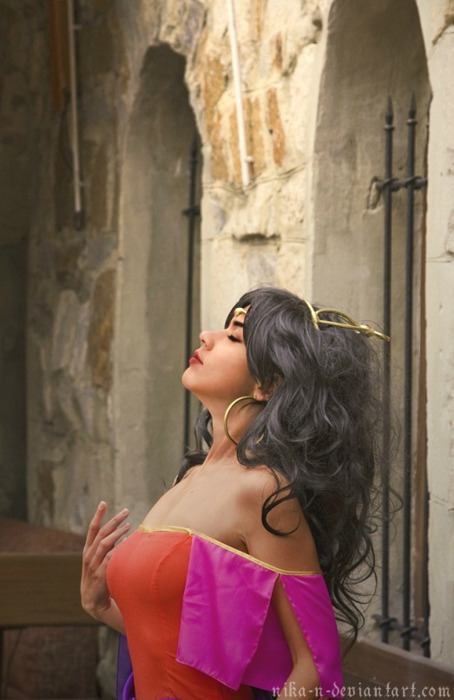 Here are some Cosplayers of Esmeralda.